ALGAE CONTROL 101 There's nothing worse than watching your pond turn green or getting thick algae build up on the stones in your waterfall. There’s nothing worse than watching your pond turn green or getting thick algae build up on the stones in your waterfall. The treatments we’re discussing today will kill the algae that’s present - a quick fix, a band-aid, BUT they won’t prevent regrowth. Once the algae is treated, use proactive products such as beneficial bacteria, to reduce future growth. Let's talk about how to select the right treatment. Selecting a treatment will depend on what type of algae and where you’re treating. 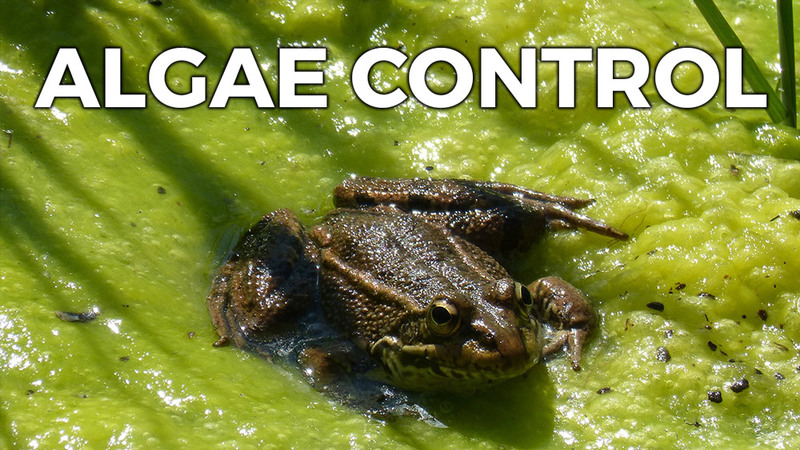 When treating green water or string algae, in the pond itself – liquid algaecides will be your best bet. For example, Microbe-Lift Algaway 5.4, Biosafe GreenCleanFX, or Aquascape Algaecide are recommended treatments. Very important to note - when treating with these products it’s imperative the pond is well aerated. Make sure circulation is continuous and add additional aeration if possible. If you’re looking to eliminate algae from a waterfall or stream, a granular form is going to be the most effective. These work on contact and are best used as spot treatments when applied directly onto the algae. Some examples of these products are Biosafe GreenClean Granular, Microbe-Lift Oxy Pond Cleaner, and Aquascape Ecoblast. With a variety of treatments on the market, it can be overwhelming. So, do research and above all don’t be afraid to ask questions – we’re always here to help. I’m Joe from webbsonline.